Knowing how to make caramelized onions using the proper method gives you an ingredient that is evenly browned and sweet. They retain their texture while providing additional flavor to the dish. 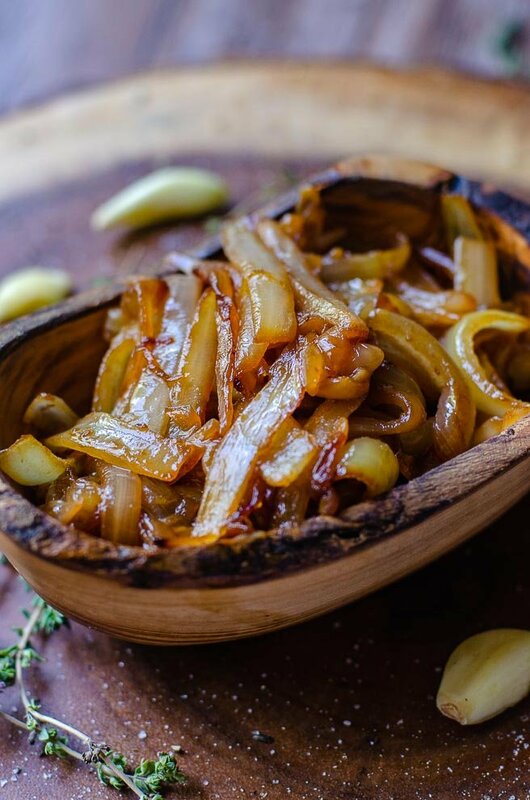 Caramelized onions have the ability to take a lackluster and flavorless dish to overwhelmingly delicious. The sweet flavor of the caramelization incites memories of warm and aromatic comfort food. And when done correctly, the caramelized onions retain their texture and provide a light crunch to your dish. Nobody wants slimy, soggy onions, right? 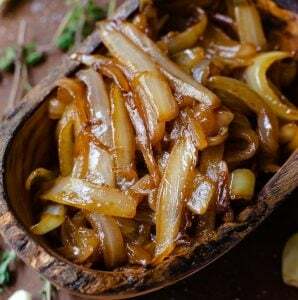 What Are The Best Onions For Caramelized Onions? 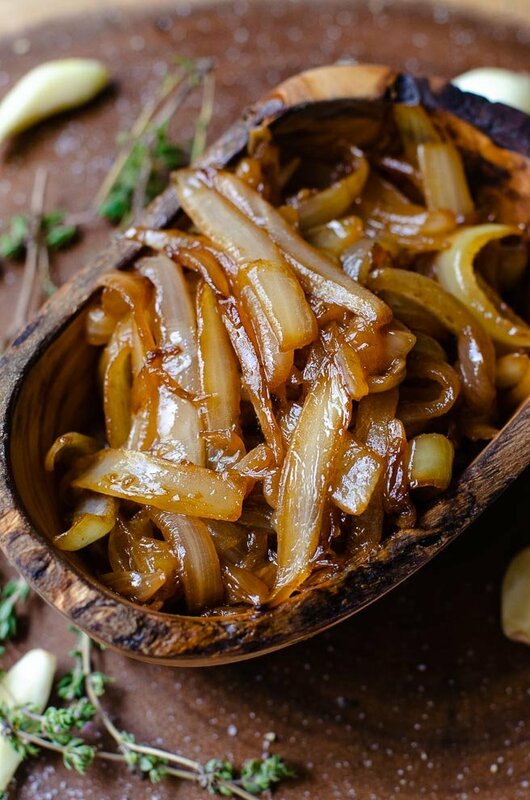 My favorite to use are yellow onions, but caramelized onions can be made with any type of onion. Depending on what you are making, the flavor profile of a different onion may work better. For example, if you want the deep flavor of caramelization, but not so overwhelmingly sweet, a white onion may work better. Perhaps you are making a gourmet caramelized onion burger, you may decide to use red onions. The same method is used for each type of onion. However, the cooking times will vary due to the different water and sugar contents. Can I Make Caramelized Onions Ahead of Time? Yes! Making them in advance is surprisingly easy. Plus, it often eliminates the stress of how long it can take to make them. Nothing needs to change in your method for making the onions, rather in how you reheat them. As they chill in the refrigerator, the fat will congeal around them. The best way to reheat caramelized onions is to utilize that fat and reheat them in a pot over low heat. You shouldn’t need to add any extra oil or butter and should only take about five minutes. If you’re in a pinch, you can microwave them, but the microwave does have the potential to unevenly overcook them. Your caramelized onions will stay fresh in an airtight container for up to one week. You can also portion them into an ice cube tray and freeze them for up to a month. When Are Caramelized Onions Done? This is often a decision of personal preference. However, caramelized onions are done when they are evenly golden brown and still retain their shape. They should also still have a bit of a al dente crunch to them. The longer you cook your onions, the darker they will become. There is a breaking point where you won’t really add any more sweetness to your onions. Instead, you’ll start adding an earthy flavor. If you decide to go for a super deep caramelization, watch the bottom of the pan for the stuck-on bits. The longer you caramelize the onions, the more that will build up and possibly scorch and burn. To get properly made caramelized onions, there is no real hack for making them quickly. However, there are a few tricks to help speed it up. Thinner Slices. If you slice the onions thinly, it will help them cook faster. The important thing is that you keep the slices as uniform as possible. Pan Size. The larger the base of your pan the quicker they will caramelize. This allows for the moisture from the onion to evaporate more quickly because they will have less overlap. Added Sugar. This is the ultimate cheat because making caramelized onions is about caramelizing the natural sugars. Nevertheless, adding a pinch or two of sugar when the onions begin to sweat will help speed up caramelization. Heat. You can speed up the caramelization by using a higher heat. When you cook at a low speed, you don’t need to stir them very often. However, when you use a higher heat, you’ll need to keep a much closer eye on them. They are more likely to scorch and far more prone to uneven or overcooking. What Are Caramelized Onions Good With? Caramelized onions are a wonderful addition to almost anything that calls for cooked onions. You can use them as a topping for steak, burgers, pizza and more. They can also be used as an ingredient in dishes like biryani, french onion soup, or even in grilled cheese. I recommend cutting the onions into ½” slices so you don’t end up with a soggy heap at the end. Caramelized onions are made by slowly sweating out the water and allowing the natural sugars to caramelize. Because you are using such a low heat for caramelizing, any type of fat can be used. I like butter because it adds richness, however olive oil would work just as well. Add a simple flavor upgrade to your dish by making these beautiful golden brown caramelized onions. When done correctly, the onions enhance the dish and provide additional texture. In a large bottomed pan, melt the butter over medium heat. Add in the sliced onions and reduce the heat to low. Stir until the onions are well coated in the melted butter. Continue to cook the onions, stirring every five minutes or so until they are a deep golden brown but still have an al dente crunch. About 45 minutes. Use the broth or acid to deglaze the pan, using a wooden spoon or other utensil to scrape up any stuck-on bits of caramelization. Add more liquid if necessary until as much as possible is released. Stir it into the caramelized onions. Salt and pepper, to taste.